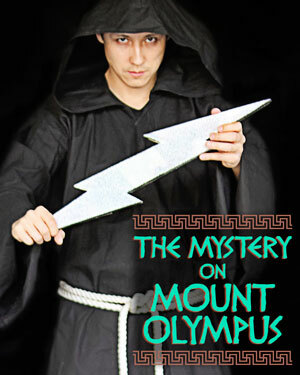 When a group of you realize that you are descendants of the Greek Gods, you go to Mount Olympus to attempt a takeover. Charon, who normally ferries people across the River Styx in Hades, is lurking around while the gods are off crashing a festival. With them out of the picture, Zeus’s lightning bolt is ripe for the taking. The precious object is imbued with all of Zeus’ power—enough to install you all as the new 21st century Pantheon. If you win, Charon will expect a reasonable job up in Olympus for helping you. He’s tired of being stuck in hell, so he’s on your side. But if you need a hint, you will have to bribe him with a gold coin . . . Charon doesn’t work for free. You’ve got 25 minutes. And remember . . . The gods and goddesses have many combined hours of practice at turning humans into animals, so work fast. Let the games begin!